Remy Martin, the cognac company, recently redesigned their bottle and threw a bunch of parties in various cities to promote the new design. 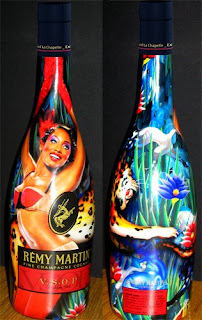 It's a gorgeous bottle, covered in artwork by David LaChapelle, with big cats and jungles and Josephine Baker prominently dancing in the center of it all. 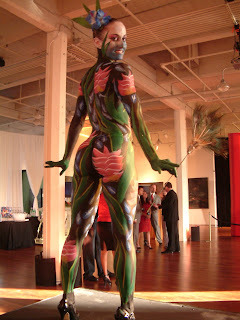 I was hired along with a couple other painters to paint 4 models for this event. I was to paint 2 models to match the "jungle" aspects of the bottle, and the other models were to be painted as a cheetah and a panther. 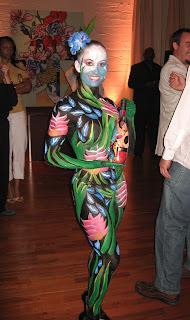 We also had a real, live Josephine Baker look-a-like for the unveiling of the bottle design. The event took place at an art gallery in San Francisco and it went off really well. The jungle designs turned out just beautiful. I finished painting my models a little earlier than the jungle cat painters were finished so I ended up helping out and doing the cat faces as well. The girls were placed on stages around the room, where they danced and posed in front of the art on the walls and interacted with the partygoers. Everyone really loved the idea and the implementation.. and it was really fun to base a design off such a fantastic piece of art! Can you please tell me the name of the flower on the models and the bottle for the relaunch of the VSOP special edition bottle.